I have a Recording King lap steel. It is model # RG-32. It was my starter guitar. It sounds great at the lower frets. Even my guitar instructor agreed. But at the higher frets, it doesn't ring out as loud or as clear. It was my first guitar too. Sadly I don't have enough experience to really critique the sound. I can say I prefer the sound of my Supro's that I acquired later on. I have the exact same model RG-32 P90 pickup in sunburst. I was thinking I might try it with a gold foil or some such thing from guitarfetish. If you are interested in buying one as a mod platform I'd sell it without too much heartache. Agreed! More music! Go Rams! There are Recording Kings and then there are Recording Kings. There's the modern Recording Kings that are sourced offshore. Then, there are the prewar Recording Kings that were sold by Montgomery Ward and were built by Gibson, Regal, and others. Most famous is the Recording King Model AB 104 "Roy Smeck," marketed by Wards from 1937 to 1941. Built in Kalamazoo, MI by Gibson. The one below has some non-original parts. I have the RG-35 lap steel. It has a humbucker pickup. It is similar to the Rogue Jersey Lightning but has a bigger body. At least it isn't as heavy as my Luna lap steel! Overall, I would say that the RG-35 is just ok. I had the older RG-31/32 they've been importing for several years. The pickup is okay, but the pots and wiring were very cheap. On mine the tone control didn't function at all, so I re-wired it with quality components. The tone quality is decent down the neck, but up the neck there is a lack of tone and sustain, in spit of the thru body design. Different string gauges might help somewhat, but I suspect it is partially due to the rather soft cheap wood the body is built from. Overall an attractive inexpensive guitar with decent tuners. I had 45 mins to kill before a video shoot yesterday so played one at Guitar Center through a Fender Pro Jr. Surprisingly good sounding for a $200 ($179 elsewhere) guitar. If you're just starting out and don't want to spend much $ it wasn't terrible. 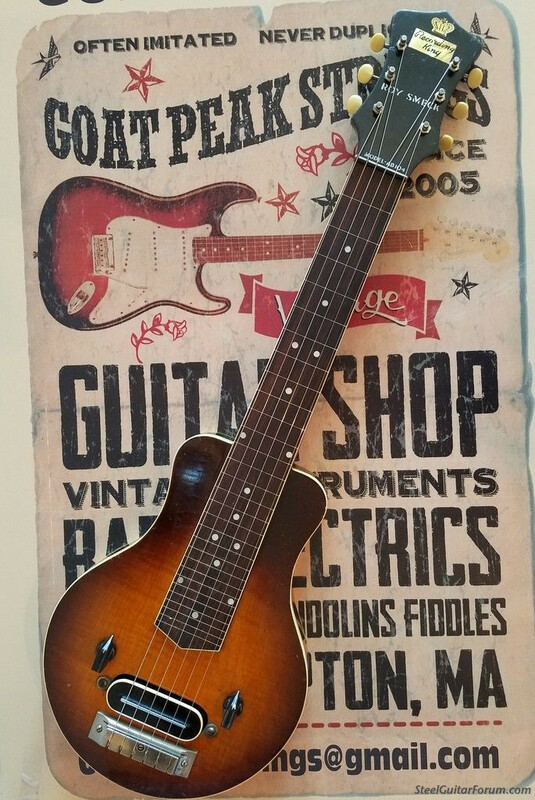 There are many vintage guitars out there for a little bit more that are better and overall, I would spend a little more and get something that has better quality woods, components, etc. All that said, it sounded better than I expected.